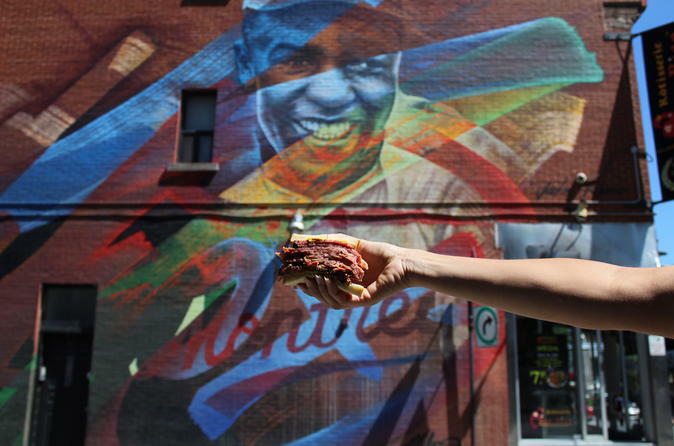 Montreal is a destination of choice for foodies. And this decadent tour invites you to discover truly authentic food from Quebec while touring one of the trendiest neighbourhoods in Montreal. You will discover everything about the origins of these traditional dishes which are a favorite among the local population and even throughout the world. This tour will bring you to popular restaurants and historical addresses of the city, it will literally feed you this local gastronomical universe! You will meet your guide near the restaurant called La Banquise, a few minutes before the beginning of the 2.5-hour poutine and smoked meat tour. This tour is offered at 11:00 AM. Present yourself to the guide who will then give an introduction to the history of Montreal and the origins of the poutine just before going to taste this delicious dish at the Banquise restaurant. You will then pass through one of the largest and most important parks of Montreal, Parc La Fontaine, before adventuring onto Duluth Avenue and St-Laurent Boulevard. This is where you will start to see some of Montreal’s urban art and observe a few of the most popular murals of the city. You will be guided to the Schwartz's Deli, known throughout the world for their smoked meat, to pick up one of their famous sandwiches. The tour will then continue towards the famous mural of Leonard Cohen. Admire the architecture and the original heritage left by the Portuguese immigrants who added much color to this vibrant neighborhood. It is the perfect introduction to the third destination, the Romados Rotisserie, where they serve poutine revisited with Portuguese sauce.